The wintery weather across the UK has caused panic-buying in the supermarkets. In our local shops, the shelves were first stripped bare of milk, bread, eggs, bacon and sausages before shoppers moved on to toilet rolls, cheese and fresh meats. I didn't look but am guessing that there must have been a gap in the tomato ketchup and brown sauce stocks too because it looks as though everyone has become fried breakfast addicts in the south east! In our household, panic-buying consisted of stocking up on vegetables and oranges, so far, we haven't gone hungry! As I am writing this, I can hear the dulcet tones of rear-wheel drive car wheels spinning on the freshly fallen snow and failing to get a grip on the slippery tarmac hill outside our house. I have no desire to leave the house right now, and I am guessing that the drivers outside are wishing they had made the same decision. 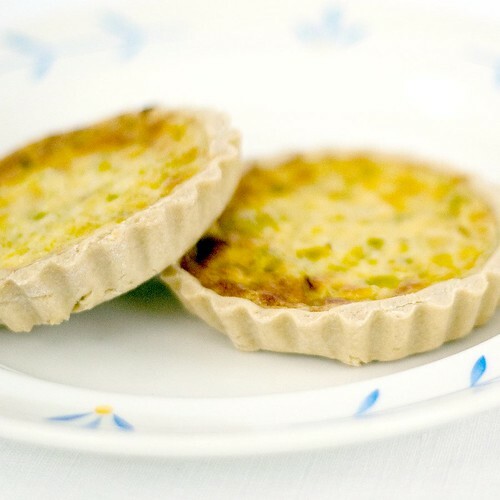 A sudden craving for a satifying smooth savoury custard lead me to making a quick leek tart last night. I hesitate to call this a quiche, as there seems to be so much negativity towards that particular nomenclature. 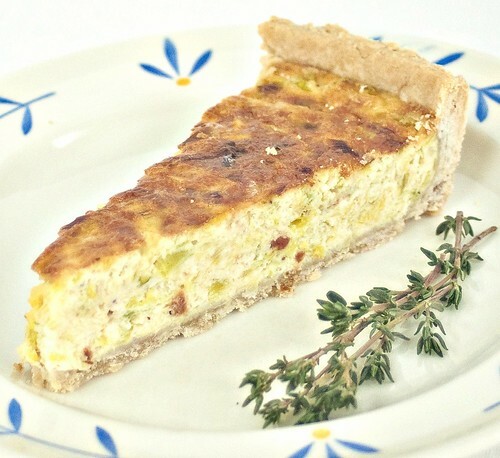 I love quiche, the teen loves quiche, and as a kid this was one of her favourite meals. To be fair, by 'this' I mean that "quiche-lorraine out of a box" (preferably from Marks and Spencers) was her favourite! And as you might expect, my home-made version was looked upon as something of a low-brow affair comparatively. I have no idea whether this was thoroughly justified or just another attempt by the under 8 year olds to besmirch my cooking! Looking back ten years, I recognise that there has been a complete about-turn in the style and quality of my cooking as I have become more and more obsessed by this strangest of art forms. I have cooked since I was a kid but only in these past few years have I gained a real understanding of flavours and structure. I suppose I have only now started to think about food and ingredients, as opposed to eating! So, in reality, the nipper was probably right to reject my quiche of ten years ago! I found lots of variations on the theme of this recipe on the internet. Most of these contain cheese which, for me, makes the creamy filling too rich and masks the gentle flavour of the leeks, but then, I am a purist! If you are not a fan of nutmeg, this is equally delicious with a touch of thyme. Add a couple of sprigs to the pan whilst you cook the leeks and pick out the stems before you mix the leeks and the custard. If you want to make this more of a gourmet delight, you can also infuse the cream with a bay leaf (warm the cream with the bay leaf to just below boiling point, then allow to cool before removing the bay leaf & using the cream in the recipe as instructed). Alternatively you could also soak a few saffron stems in a little water and add that to the custard instead. I was a bit impatient to get this into the oven so didn't leave the pastry to rest for thirty minutes before rolling. I thought I had got away with it until I went to move the smoothly rolled sheet over the pastry case, at which point it fell apart completely! So, whilst I waited for the pastry to rest properly, I prepped the leeks - which is, of course, what I should have planned to do in the first place. This recipe is very easy to make and delicious to eat, so my impatience was quite justified. I had promised myself a chiled glass of manzanilla with the tart (and not before) so that was the real reason for rushing the pastry. Whilst sitting down to eat this together, the teen declared her new passion for a vegan diet (forget the eggs and cream in the tart, th enext bit is even better). On tasting this, she followed this statement up without so much as a pause for breath, by suggesting that this tart would be even more delicious with nuggets of crispy smoked bacon or salmon fillet included. Fickle? A teenager's prerogative! This recipe is just as good served as a summer lunch as a winter supper or snack. Do enjoy it! remove the cooked tart shells from the oven, carefully tip the hot beans off the tart into a heat proof bowl and leave to cool, remove the baking paper too. It looks really delicious, I love a good quiche too and I love your comment about the new vegan in your household already discussing the prospect of bacon. I've been hunting for a nice easy quiche recipe, this one looks divine, love leeks! I love this post! Great writing ... and a great quiche! Nice recipe kate. I really enjoy making quiche, and especially tartlets. Working with pastry really appeals. The worst part though? When you have a peek in the oven and they've risen to an amazing height, only to fall flat again when you take them out. Matt, I think we just have to face facts - they go flat! I don't care because they taste great! Though I supposed the other option would be to put more custard in ... but that could lead to disaster! Kath & Rosanna, thanks for your comments. This is extremely easy, especially if you have ready made pastry and it tastes great (almost as good as M&S!). Mmm I love quiche, this looks great. lol at the teen! Yummy, that looks sublime and I also agree with your daughter about the addition of bacon mmmm! !